Star Boy Wizkid seems to be back in good terms with former Empire Mates Entertainment (EME) label mate Skales as both artistes reunited at the One Africa Music Fest in London. 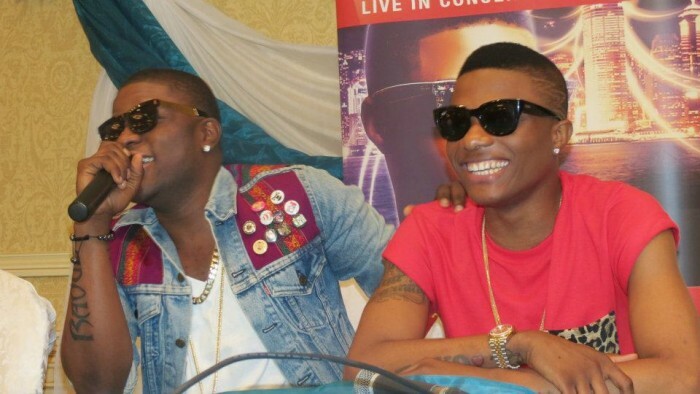 Skales and Wizkid before the social media beef (while in EME). Both artistes seemed to have left their beef in the past as Skales shared a picture with Wizkid on his Instagram page looking chummy. Wizkid and Skales used to very close back when both were in Empire Mates Entertainment (EME) record label, until they left the label and admitted to having differences. While in EME they recorded the hit song ‘Baddest Boy’ which also featured Banky W.
Well, all that beef on social media is left in the past now and fans are certainly excited about the reunion. Hopefully more hits from the artistes will be released soon. Skales is currently signed to Baseline Music Records.